In order to help you get started on your first retargeting campaign, you can find our suggested 'Best Practices' set up below. A prerequisite for running a retargeting campaign however is that you have the Yieldr Ads Pixel implemented on your website, and that your cases have been created. If this is not the case, you can find more information about creating cases here and we suggest you read this article about how to implement the Yieldr Ads Tag on your website. 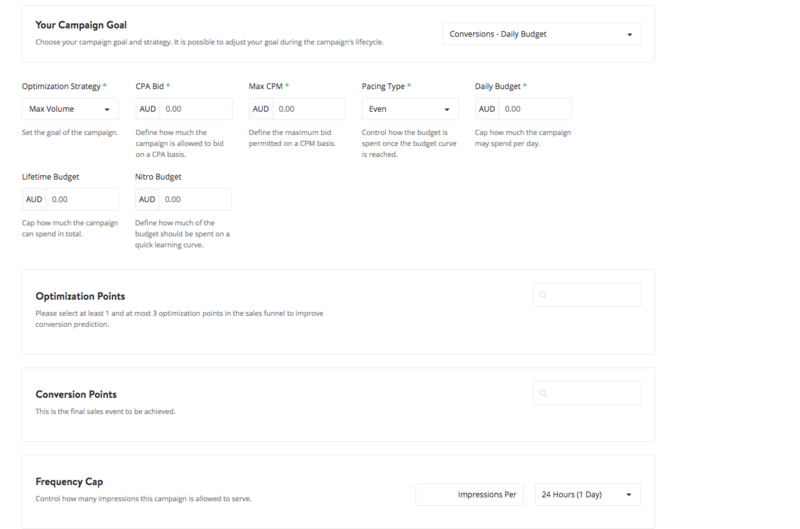 First select your advertiser in the platform, and then navigate to the "Advertiser Name > Campaigns" section in the left navigation bar. Click the "+" button and then select "RTB" in the top right corner to get started. This will open a new campaign which you can setup according to your own preferences. 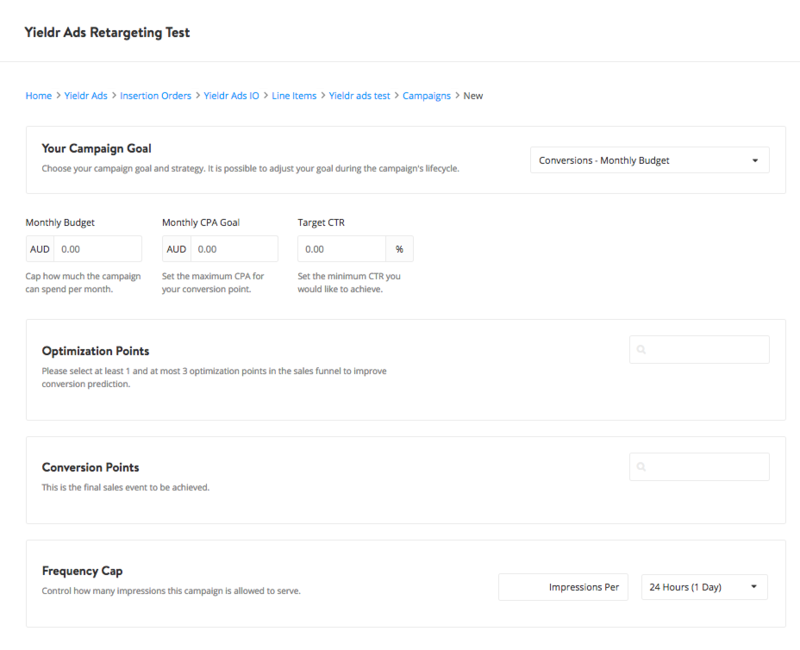 Don't forget to select "Retargeting" as the campaign type of choice under "Campaign Type". For more general information on how to create a new RTB campaign, you can refer to this article. Choose Your Campaign Goal: Select "Conversions (Daily Budget)" from the dropdown in the top right of your screen. Optimization Strategy: Select "Max Volume" from the dropdown. CPA bid: Set your CPA bid according to your CPA goal. It is recommended to set the campaign CPA goal a little higher than your actual goal. In this way the algorithm gets more freedom to optimise towards your end goal. Max CPM: Insert your max CPM bid. Recommended bid between 7-12 Euro. Pacing Type: Select "Even" from the dropdown. Please note that you should ONLY select "ASAP" when you want your budget to be spent as soon as possible! Lifetime & Nitro Budgets: These functionalities are optional. The "Lifetime Budget" option sets a cap on the maximum a campaign should spend, but is for tracking purposes and does not provide a hard stop when the budget cap is reached. The "Nitro Budget" option defines how much of the total budget can be spent quickly to speed up the initial learn of the algorithm. Please contact your Yieldr Support team if you have any questions about these functionalities. Choose Your Campaign Goal: Select "Conversions (Monthly Budget)" from the dropdown in the top right of your screen. CPA Goal: Set your CPA bid according to your CPA goal. It is recommended to set the campaign CPA goal a little higher than your actual goal. In this way the algorithm gets more freedom to optimise towards your end goal. **When running performance campaigns don't set the frequency cap too tight. Yieldr will algorithmically optimize the frequency and recency levels. Low frequency caps are generally obstructive to your campaign and can hinder your campaign performance and delivery. After following through the campaign set up wizard, and setting the stage for your retargeting campaign under "Budget & Strategy", it is important for any retargeting campaign to be able to run smoothly to set up the targeting of your audience in the correct way. 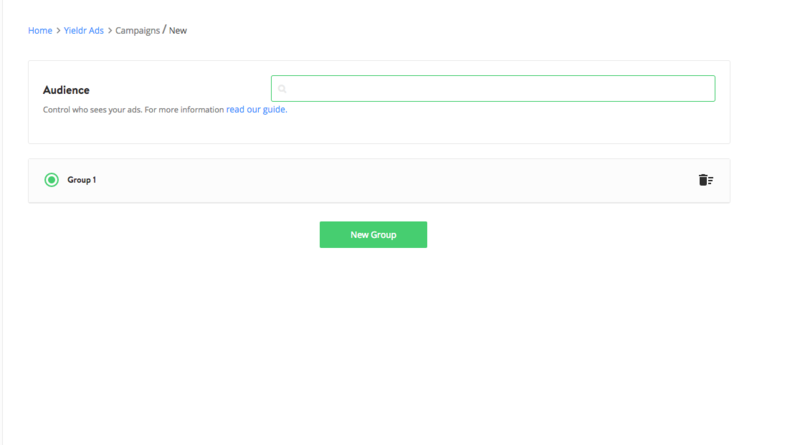 Under "Targeting Options > Audiences" you can control which audience groups will see your ads.